Charlie wears his Thundershirt for the last time. The chest strap proved to be a better chew toy than his many bones. OK, so the Thundershirt lasted exactly one week. Charlie managed the chew through the chest trap, turning it into a useless doggie tubetop. Desperation kicked in, and I thought I could salvage the destruction. I pullled the chest strap tighter, just barely fastening the gnawed remnants of velcro together. Part swaddling/part straightjacket, the shirt is designed to alleviate doggie stress. Sadly, it was no defense against Charlie’s anxiety. I’m sure it didn’t take much to pop the chest strap open once we left for Eastern Market. The good news is that Charlie was so busy chewing his Thundershirt that it didn’t even occur to him to chew on the window sill. Whatever progress we made with the Thundershirt, quickly unraveled with a late-night car ride to 7-Eleven. I could tell Matt was feeling hopeful, as he pulled out the red retractable leash belonging to Charlie. As they pulled away, I was relieved. Daddy spending some quality time with his boy. Fifteen minutes later, the front door flew open. Something (possibly profane) was said about the dog. One thing was clear. The dog was in BIG trouble. By now, Charlie was nowhere to be seen. Looking back on it, the obvious question to ask: Was Charlie wearing his Thundershirt? The answer is no. It was just a quick trip to the store. Still it was just enough to illustrate it doesn’t take much time for separation anxiety to rear its ugly head. Charlie resurfaced, trotting through the front room without a care. I could see the temperature rise in Matt. He decided to seclude himself in the library. It was for the best that Matt and Charlie take a breather. Charlie remained on good behavior for the next couple days. I think he knew it was in his interest to lay low, and to administer lots of puppy kisses. Matt and I started feeling confident again. We suited him up for a visit to see Matt’s grandma. Upon arrival, Charlie cowered and immediately peed on Matt when he picked him up. Somehow, the Thundershirt just wasn’t working in this instance. When Matt came home, we left Charlie in his Thundershirt and went out for lunch. I didn’t notice the destruction when we came home. After all, he was wearing it. The Thundershirt. He had chewed through the neck strap and reduced it to a sweater band around his belly. In the next few hours, we played with Charlie, talked about our options, then wrapped what remained of the Thundershirt around him. We were exasperated. We left for dinner, and two hours later hesitated before walking back in. The house was in one piece, and so was the tattered shirt. Documenting Lex in her favorite chair. With all the hub-bub caused by Charlie, it was easy to miss something is wrong with Lexie. Her hind legs are buckling under the impossible weight of her frail 28-pound frame. Just standing at her dog bowl, her legs slide out beneath her. We’ve placed a rug by her bowl to provide some traction, but that leads to her next problem. Her appetite has diminished. 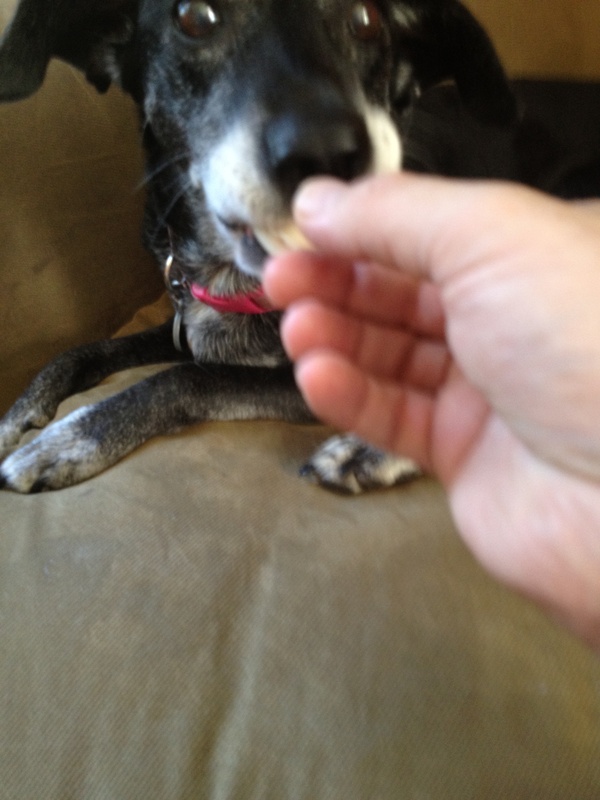 I’ve taken to spoon-feeding her wet dog food. But the last two days, she’s just turned her nose to the food. She’s managed to get by on a handful of biscuits, a slice of turkey and a piece of cheese. And there’s the matter of her peeing on herself. Sigh. She has no idea, but she’s been wetting her dog bed and our couch. Lex nibbles on a piece of cheese. 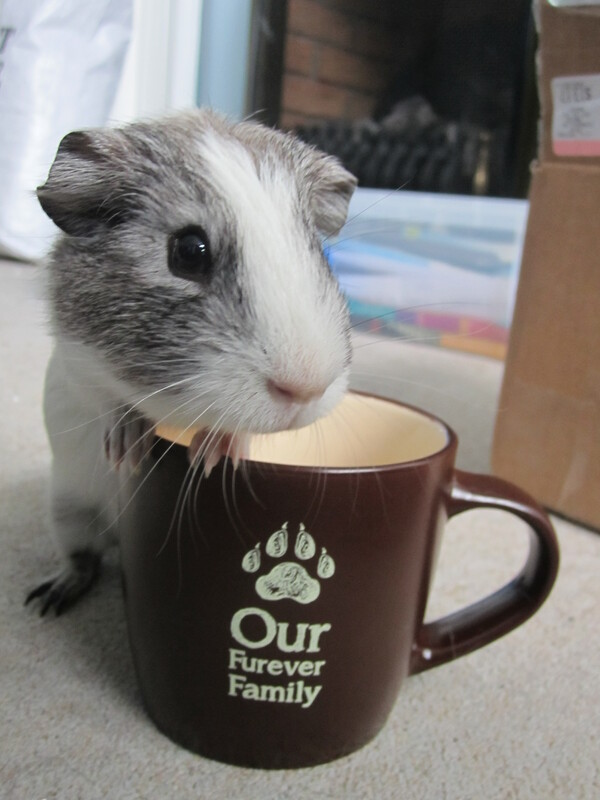 Apparently much tastier than mushy dog food. I brought all of these symptoms to the vet today. She said Lexie definitely is experiencing kidney failure, which affects her urinary habits and possibly her appetite. The vet prescribed a kidney-friendly painkiller to hopefully help Lex stand without pain. Lex also will go on a med to help with her pee issues, and we added in an antacid in hopes of making food a bit more yummy. All-in-all, we are fighting a losing battle. The vet said many dog owners simply will euthanize their dog when it starts wetting in the house. My heart sank. “I’ll get doggie diapers if I have to,” I offered. Lex doesn’t have much time left. This much I can hardly bear. The first thing Charlie did once we got the Thundershirt wrapped around him? He yawned. We both agreed he was noticeably calmer. 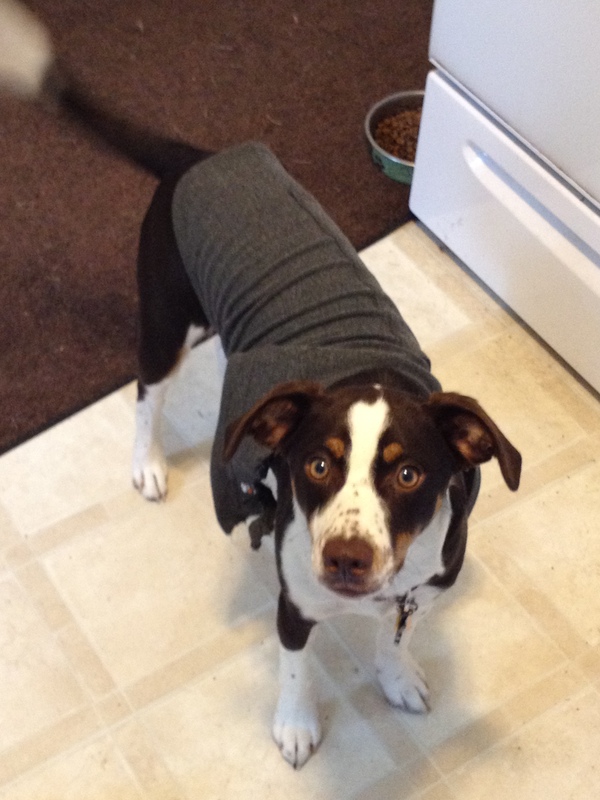 I have to say when we first heard about Thundershirt, Matt and I hesitated. The concept seemed too good to be true. 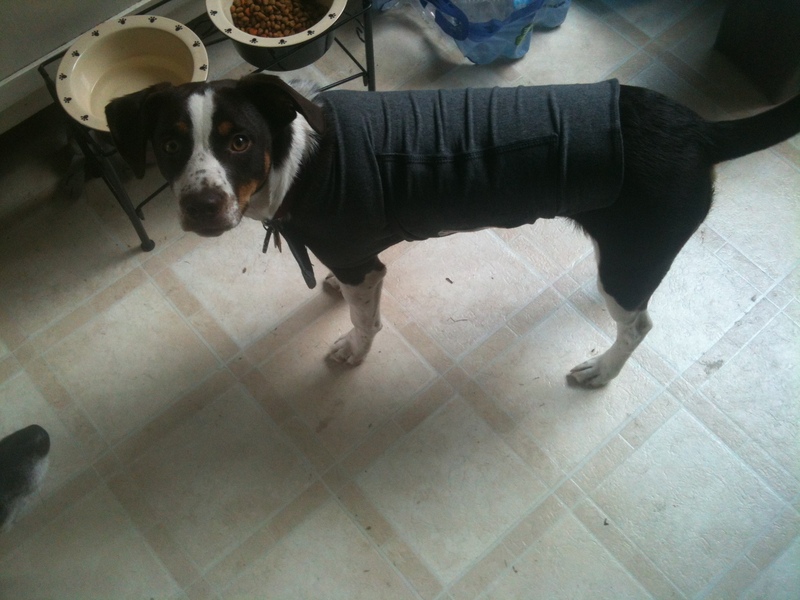 Eliminate a dog’s separation anxiety by wrapping a tight shirt around him? Sure. I guess I’ve heard of weirder things. But then we got a solid recommendation from our friend Lenny Z. And we watched a favorable news report. This was followed by testimonials from a few more friends. Charlie fit in the low end of a size medium, so he will be able to grow into his Thundershirt. We went to the website and poked around. 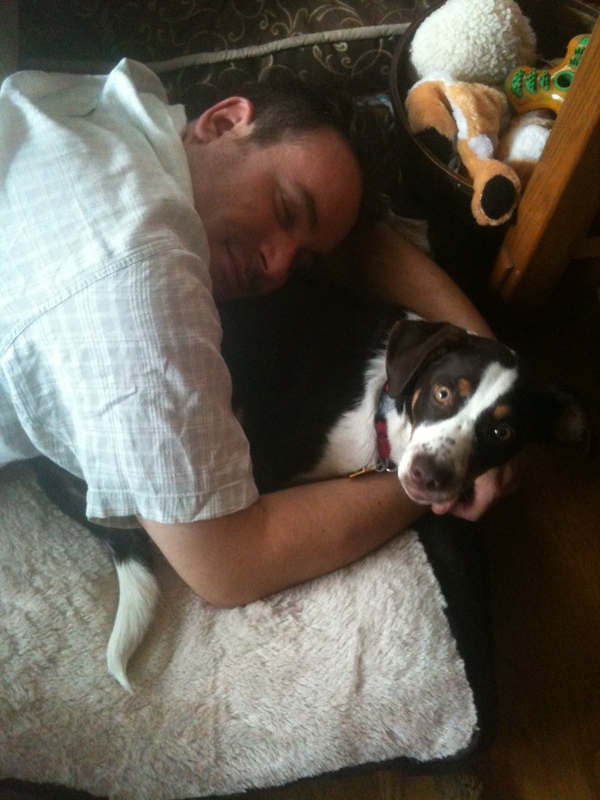 After seeing that Thundershirt offered a full refund if it didn’t calm our pup, Matt and I were ready to commit. Honestly, it felt good to have a solution. Even if it wasn’t a guaranteed solution, we finally had something to try out. The last few weeks with Charlie have slowly been eating at us, like a swift river tearing away at a river bank. His destructive nature has startlingly increased, and in recent days he has taken to barking at absolutely nothing at all. Sure, he is a border collie mix, but really?!? Our nerves were raw, and we needed something — anything — that would provide a bit of encouragement. We bought the Thundershirt at a local PetSmart, where an associate told us we were making a good purchase. Since the store started carrying them last fall, the store has only had one return. Matt and I locked eyes. Was that hope we were feeling? As soon as we got home, I ignored the 90-degree weather and tore open the box. Charlie would at least try it on. I pulled out the shirt, and marveled at all the flaps and velcro. Part swaddling/part straightjacket, it was surprisingly easy to get on. Thank goodness Charlie did not fight me. As soon as I fastened the last flap of shirt, Charlie looked up at me and yawned. His eyes seemed a little heavier than usual. He snuggled into me. We kept him in the shirt for about a half-hour. It was long enough to see a change in Charlie, and to know that we would wrap him up in his Thundershirt when we went out for dinner. As luck would have it, a loud, boisterous thunderstorm rolled through while we were dining at a Korean restaurant about 20 minutes away. Knowing Charlie was wearing his Thundershirt, we crossed our fingers and finished dinner. Charlie greeted us at the door. We slowly walked in, scanning the couch for wood shavings from the window sill. The room was spotless. The window was still firmly affixed to the wall. Charlie was happy to see us, but not in the desperate way we has grown accustomed to. After our first day, we’re cautiously considering this thunderous therapy a success. Matt and I spent the better part of an hour today arguing if the little brown dog on the webcam was in fact Charlie. I won this bet. At least I say I do. Camp Bow Wow allows us unfettered viewing of Lex and Charlie. I access the footage through an app on my iPhone, so you can guess how small the images are. This little dog looks a lot like Charlie, but I’m saying his fur is not dark enough. Also Lexie is missing and the place has kept them together up til now. 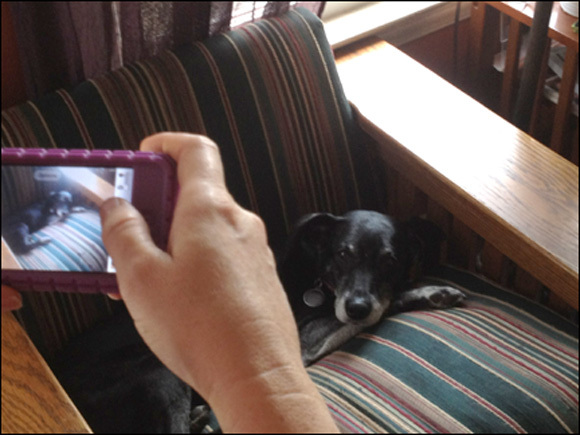 So yes, it’s kind of odd spying on our pups like this. But it’s made our vacation so much easier, knowing we can literally check in. Having the ability to watch them from afar, we have discovered a few things. Lexie is much more spry than we originally thought. She may have dementia and kidney disease, but we clearly saw her trotting deep in a pack of dogs. She was keeping pace, and even initiated playing once or twice. Charlie is a leader at heart. More importantly, he’s a border collie. There’s no more denying it. Spending his days with about 15 other small dogs, he focuses much of his energy herding them. More often than not he will gather about 10 dogs into the middle of the room and trot around them. Then he will lead them outside for a romp on the grass. 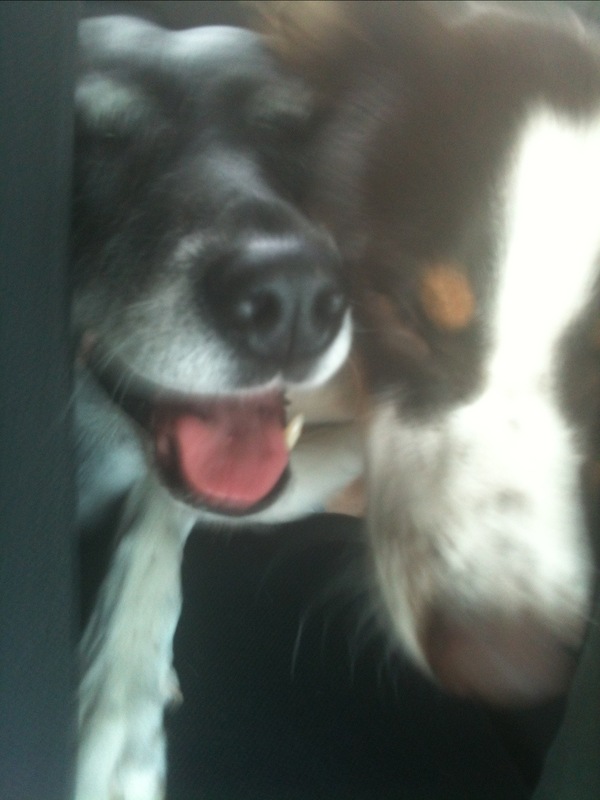 Classic border collie behavior. Perhaps I should introduce him to some sheep. For the record, I won the bet. I just checked and a puppy that clearly is Charlie is back in the pen, wrestling with a English bulldog. I’m betting he’ll be herding that dog in no time. Charlie and Lexie answer important questions during their intake interview at Camp Bow Wow. Most pet owners know planning for a vacation can get complicated. Now add a puppy and an ailing dog to the mix. To put it simply, I’m not anxious to hand them over to anyone. Back when Lexie was younger, going out of town was easy. Sometimes even last-minute. I’d call a friend to check in on her and feed her once a day. With the dog door, she needed very little supervision. As she aged, and her anxiety rose, we started to use doggie day care or would board her for short trips. Now Matt and I are preparing our first major trip together. On a plane, even! Between Lexie’s limited mobility and assorted medical issues, and the fact that Charlie is 100 percent puppy, we realized we would need to board them. 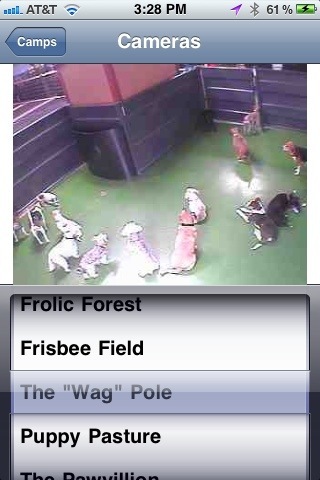 On occasion I had used Camp Bow Wow in Ann Arbor for doggie daycare with Lexie. So we looked into it, and it ends up there’s a Camp Bow Wow closer to our house, as well. 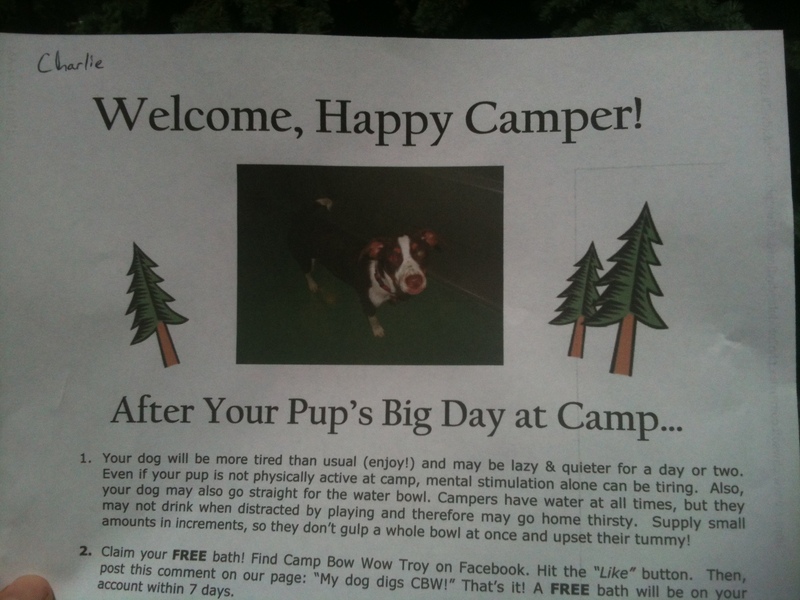 Since Charlie had never been to Camp Bow Wow before, we made an appointment for an intake interview and tour. We were shown the cabin that Lexie and Charlie will share, their indoor/outdoor play area (monitored by webcams) and left the pups in a large playroom for their interview. We were allowed to watch from the lobby on a large monitor. Both dogs eagerly interacted with the woman running the interview, then different kinds of dogs with varying energy levels were brought in. Lexie mostly ignored them, and Charlie wanted to play. Afterward, I was told to leave them for a couple hours so the staff could figure out which play group to assign them to. After grabbing lunch, I went back and spotted Lexie trotting at a moderate speed across the screen. Was that my geriatric dog? She looked great. And Charlie was running back and forth, his tail up in the air, the tip curled. Was he smiling? Charlie takes a good photo. I made my appointment for our upcoming trip, and received a welcome report on Charlie. Both dogs were assigned to play in the small dog group. That sounds perfect. The guy at the front desk assured me they both did great, and will do fine when I bring them back. I know they can’t wait. 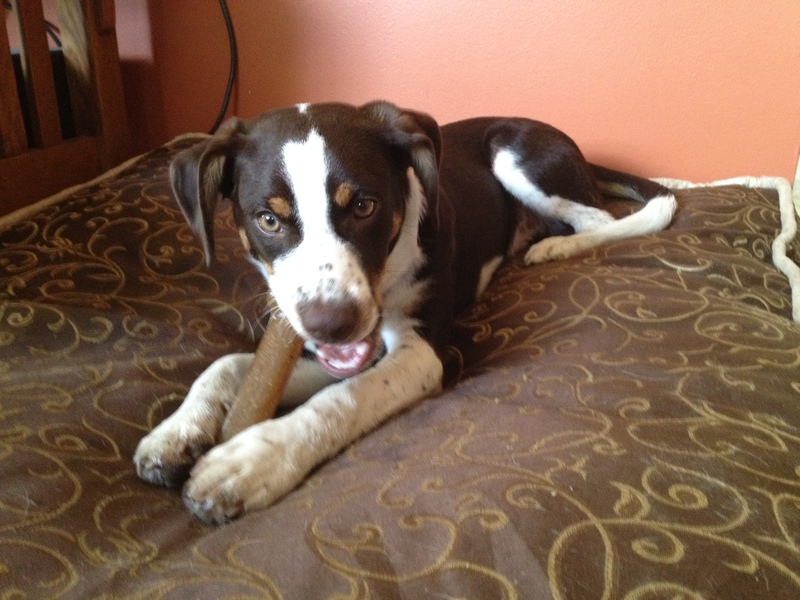 I’ve got a Nylabone, and I’m gonna chew this instead of the couch. I puppy-paw swear! Since we adoped Charlie, Matt has been a constant in his life. And now, for the first time since Charlie has lived with us, Matt is going away on business. For a week. How on Earth will Charlie survive? Rumor has it, Charlie has plans. Like sitting on the couch. And sleeping in a human bed. And eating lots of cat food. Maybe even pooping on the laundry pile. Matt’s eyes turned red when I disclosed Charlie’s itinerary. “That’s my greatest fear! That you will undo all my hard work and training!” he accused. 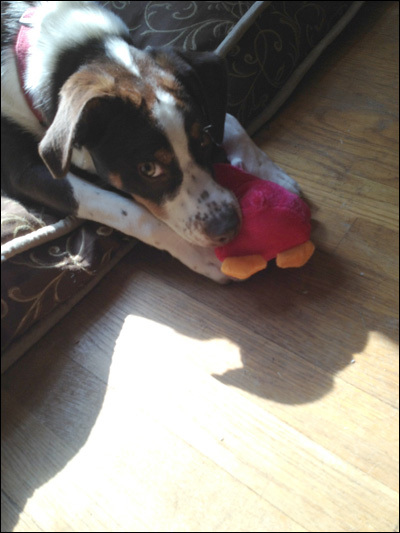 The truth is it would be a lot more trouble to let Charlie run wild, than to continue with his training. He craves discipline, and is eager to please. And who can resist the wiggly puppy dance from a dog who just mastered “sit” for like the hundredth time? I imagine I may allow a short nap on my belly, and perhaps some surprise table scraps, but I’m expecting nothing out of the ordinary. Since buying separate dog beds for Charlie and Lex, they both sleep comfortably on the floor next to us at night. We’ve fallen into an easy routine, with the dogs sleeping in their beds (with a few choice squeaky toys for cuddling, of course!) until morning. Then I usually get Charlie out in the yard for his morning potty. I learned a lesson by opting to change some laundry first thing the other morning, and Charlie trotted down and proceeded to pee all over the blanket at my feet. Well, it was in a pile waiting to get cleaned anyway. Sigh. The point is, I feel I have things under control. The only thing I’m really concerned about is the time when I go to work. We’ve successfuly left Charlie and Lex alone for a few hours, but nothing like 10 hours straight. I’m concerned he will miss me, or his buddy Matt. I really hope he won’t cry. Charlie, that is. So Matt is leaving for a week, and the heat wave is in full blast. Like much of the nation, we have had countless days in a row of 100-plus degree weather. 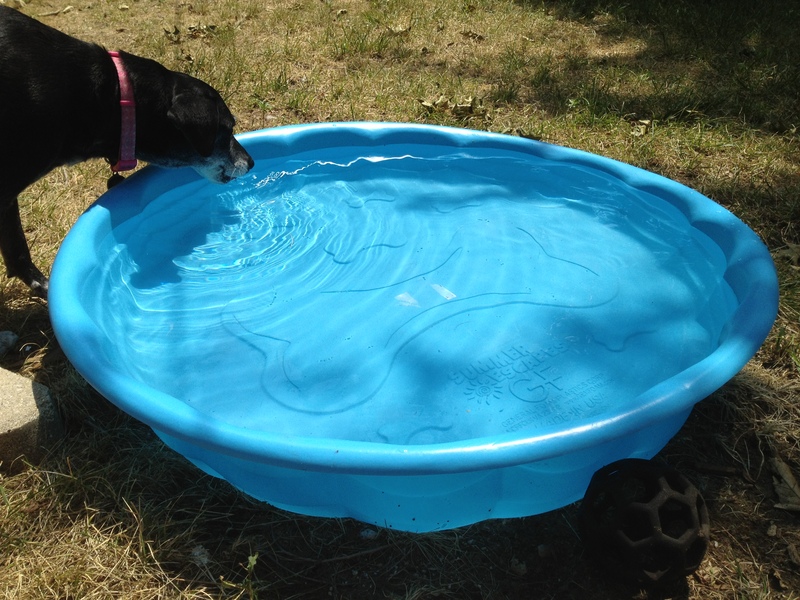 To help keep us cool, we bought a wading pool at PetSmart. It even comes with decorative bones instead of fish. Ya know, because dogs can tell the difference. I couldn’t wait to get home, and actually called dibs on filling the pool with water. My eyes glazed over as I imagined Lex and Charlie diving in, frolicking in the water. As soon as the water filled up close to the rim, I called Charlie over. He sniffed at the pool, then backed away. Matt scooped him up and placed him in the water, sure he would bounce around. Instead, he promptly hopped out and rolled in some sun-burned grass. Lex walked toward the pool. She really surveyed the situation. I was hopeful. She took a step right to the side of the pool, lowered her head, and took in a long slurp of water. Lex had just discovered the largest water bowl in Detroit. What? This is supposed to keep me cool? Slurp-slurp. Ya know, you’re right!